The cyclist who was struck by a vehicle in what police are calling a hit-and-run on the A27 has died. Emergency services who attended made attempts to save the cyclist’s life but the 50-year-old man from Hampshire died at the scene on the Chichester Bypass, Sussex Police confirmed. 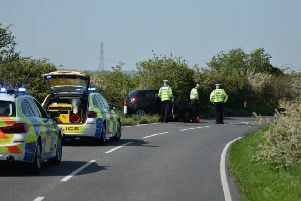 The collision occurred at around 7.20am (Thursday, May 10), on the eastbound carriageway of the A27, just beyond the Stockbridge roundabout. The eastbound carriageway between the Stockbridge and Whyke roundabouts remains closed and is hoped to be re-opened before evening rush hour, police said. Sussex Police have made an urgent appeal for any witnesses. Detective inspector Jason Hazzard, leading the investigation, said: “It is vital that anyone with information about this collision, or who thinks they may have been involved, comes forward to speak to us. “It was a busy time on the road, and we believe there may be several witnesses who have not yet contacted us. “In particular, we are keen to talk to two men wearing shorts and with tattooed legs who were seen beside a small white van which had stopped nearby. An air ambulance was on the scene but paramedics were unable to save the cyclist’s life. Anyone with information is asked to report details online or by phoning 101, quoting Operation Redstone.